Over time women have forgotten that ‘birth” is a natural and normal process as they have been bombarded by the clinical and medical side of pregnancy and birth. Many times there is a lack of preparation and education and also the conditioning of our mind from a very young age that birth is painful because of other people’s experiences. We are also exposed to movies, images and TV shows that depict childbirth as a horrendous event that should be feared. celebration and a calm, happy experience. This is an opportunity for me to provide all women (pregnant or those contemplating pregnancy) and their partners or support people with information and education about positive pregnancy, labour and birth experiences. We need to go back to basics. I will aim to free you from fear about the birth of your baby. your baby the way you want to. You just need to let go and release all doubt and trust that your body knows what to do. Is This Online Course For You? 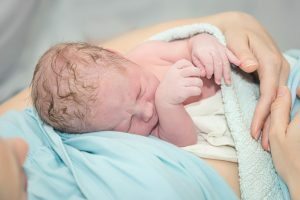 If you are feeling anxious about your labour and birth, or you just want to be more prepared, or you want techniques to help you have a positive birth experience, or you want your partner or support person to feel they have all the right tools to support you on the day, then you are in the right place. Women who prepare themselves mentally, physically and emotionally for their birth are more likely to have a positive, calm birth experience no matter how their baby is born. When I was pregnant with my first child I didn’t do any preparation or education around childbirth and what to expect or to prepare myself for when things don’t quite go to plan. I thought I would just go with the flow. Unfortunately I developed pre-eclampsia, which quickly developed into eclampsia, which meant my baby had to be delivered by emergency caesarean at 32 weeks without delay. This was an incredibly traumatic time, and that created such fear and dread for any future pregnancies, which after several miscarriages only blessed us 15 years later. Looking back, I wished I had prepared myself for what to expect, and for the possibility of something not quite going to plan, and being able to use techniques so that I was calm and coped better. on our mind, body and future experiences. This then started my interest and desire to help and support other pregnant women. I have trained in different modalities for over 30 years and have many qualifications. I have been working with pregnant women in massage and maternity care since 2006, which has provided me with the experience to work with pregnant women on all levels – the mind, the body, the emotions and the spirit. Every woman is unique, and what works for one woman, may be completely different for another! In this course I will cover the mind, the body, the emotions and the spirit. All of these need to be working in harmony together to be balanced, so that you are ready to birth. This online course will give you all the information you need for your pregnancy, labour, birth and immediate postpartum period. There are 7 modules and extra resources to learn at your own pace and in your own time. You will have LIFETIME access to this course (for as long as it is operating), so you can keep going back and refreshing your mind on all the techniques and ideas as well as having access to any new tools I add along the way. In the videos I will guide you through each module – it will be like having me right there with you. You will also be able to download guided meditations for relaxation and fear release. Each module will include “Your turn” worksheets so you are making a commitment to practice those key tools and techniques you learn. There will also be a self-hypnosis track to download for pregnancy and birth relaxation. Give yourself the opportunity to be prepared, educated and confident so that you can birth your baby in a positive, calm way. Birthing your baby will be a labour of love, and will certainly be the most rewarding experience you will ever have in your lifetime. Back to Basics Birthing Recipes eBook for warmth, healing and comfort. Positive Affirmation and Visualisation posters to download that will inspire and uplift you every day. 20% discount for face to face or skype appointments. Membership to the Postpartum Support Group monthly meetups (based in Perth, Western Australia). Wonderful extra surprises that you will just have to wait and see! You will have LIFETIME access to the Back to Basics Birthing private Facebook forum. Once you have been added to the group, you can ask questions, and continue to be encouraged and motivated by me and other women who have also chosen this course. You will develop strong relationships with other couples, while sharing your successes and challenges in a safe place that provides evidenced based information, ideas, solutions and positive reinforcement as well as encouragement. I trust, I believe, I give. If you don’t love the Back to Basics Birthing online course, just let me know within 7 days of joining and I will refund your money in full. I can offer this money back guarantee because I really believe in the power of positive thinking, the power of the effects this course will have on you, and the power of being a part of a positive, nurturing group. In exchange, your promise to me is that you will have put time and commitment into doing the work sheets, watching the videos and listening to the meditations and hypnosis tracks before asking for a refund. I want you to really enjoy your pregnancy, and to become mindful of the feelings you have, which might be causing doubt or fear in your mind and body, which could inhibit the beautiful cocktail of hormones you need for a positive, calm birth. I want you to marvel at the child that you have growing inside you. I want you to believe in your body’s natural ability to birth your baby. I want you to feel strong, empowered and knowledgeable so that you can ask questions when the need arises, and you can use the tools and techniques for a positive, calm birth no matter how your baby is born. Your investment in this life time membership is $395, which I feel is great value for money for all the tools, techniques and bonuses that you will receive as a member. You will also be supported and encouraged in a beautiful, safe and respected environment.